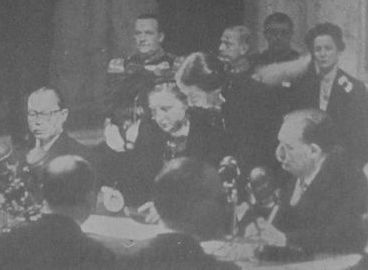 ... 1949, at the Royal Palace in Amsterdam, the former Dutch colony of Indonesia finally was granted independence when Queen Juliana of the Netherlands and Vice-President of Indonesia signed the declaration of Indonesian independence (right), thus marking the official transfer of sovereignty. (photo credit) Indonesia had made the declaration 4 years earlier; a national revolution had occurred between then and the signing that took place on this day. Events in that interim period were in the news earlier this month, when the Netherlands formally apologized to Indonesia for a massacre on December 9, 1947, when "up to 430 boys and young men" in an Indonesian village were killed "by Dutch troops."